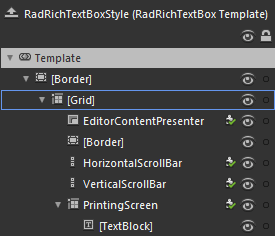 Like most controls, RadRichTextBox also allows you to template it in order to change the control from the inside. Except for templating the whole control, you can template only parts of it or even independent controls related to it. This topic will make you familiar with the structure of RadRichTextBox's template. Here is a snapshot of the template generated in Expression Blend. [Border] - represents the background and the border of the RadRichTextBox, and is of type Border. [Grid] - hosts the RadRichTextBox layout and is of type Grid. EditorContentPresenter - represents the document area of the RadRichTextBox and is of type EditorContentPresenter. [Border] - represents the visual element in the right bottom corner that appears, when both of the scroll bars are visible. It's of type Border. HorizontalScrollBar - represents the horizontal scroll bar and is of type ScrollBar. VerticalScrollBar - represents the vertical scroll bar and is of type ScrollBar.